Monday August 3 is a “Civic Holiday” in Ontario, so the Toronto Stock Exchange will be closed. A Civic Holiday is a holiday for no reason at all, other than we only get two decent months of summer in Ontario, so days off in the summer are a welcome break. The weather has been cold and rainy this summer, but the weekend is looking good, so I’m keeping my fingers crossed that I’ll be able to spend my time outside, by the pool. I’m looking forward to a relaxing break by the pool, since my powers of prediction this year have been non-existent. I have expected a continuation of the Second Depression, and resulting weakness in the stock market, and I have been totally wrong. The S&P has just completed it’s best five month streak since 1938. The Dow had it’s best monthly gain since 2002. The Toronto Stock Exchange had it’s fifth straight monthly gain, and made a new high for 2009. Obviously I should have invested every penny in whatever stock I could find during the April lows, and I would have massive profits to show for it today. I didn’t. I’ve stayed on the sidelines, and watched the profit pass me by. Okay, perhaps that isn’t evidence that the market is due for a correction, but isn’t it a sign of the end of the world? If there are two people in the world who should be together it’s a beautiful but not-very-smart actress/singer and a beautiful but never-won-a-playoff game quarterback. They are made for each other, and if they were honest about their abilities they would realize that. But they aren’t. Presumably they both think they can do better. And that, my friends, is where the markets are today. Earnings are dismal, consumer confidence remains low, but the markets are on a multi-month winning streak. They obviously believe they can do better. And maybe they can. (Note to self: why am I starting so many sentences with the word: “And”)? But I just can’t help but believe that 1,000 on the S&P is a very significant resistance level. 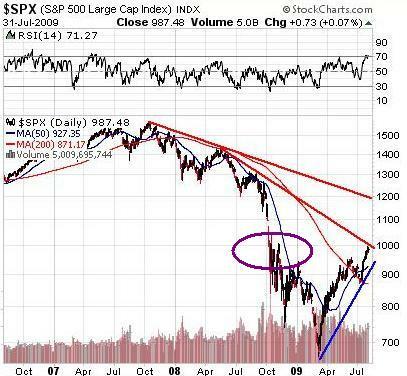 The markets fell below the 1,000 level in the crash of October, 2008, dropping to the 900 level on October 10, 2008. 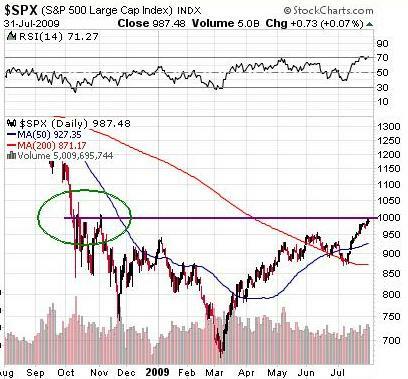 The S&P bounced back to 1,000 on October 13, but it didn’t hold, and we were back to 907 on October 15, 2008. The next bounce up to and including October 20, 2008 only got the market back to 985, and that’s as high as the S&P has risen, until Friday, when it closed at 987. As I mentioned last week, I also worry about the RSI, now at a very high 71; tops typically happen anywhere over the 70 level. Perhaps a decisive close above 1,000 this week will change my mind. Of course I’ve been worried for months, to no avail, and the market won’t do what I want; it could continue rising for months to come. But I think at some point the cracks in the armour (or armor for my American friends) will become evident. Here’s my thinking: in low interest rate environments, stocks go up, even at times in spite of the fundamentals. If the company I am investing in can borrow at 10%, as a common share investor I want to earn more than the going rate of interest to compensate me for my risk: let’s say I want to earn 15%. I may therefore be willing to pay $10 for the stock. If interest rates drop to 5%, the borrowing costs for my company are now 50% cheaper, and my earnings expectations relative to the going rate of interest are also lower, so perhaps I’m now willing to pay $15 for that same stock. The company I’m invested in may not be producing any more product, but the combination of the lower borrowing costs and my reduced profit requirements combine to increase the share price. Don’t believe me? I’m sure you all recall the year of my birth, 1964. The Dow Jones closed that year at 874. As I grew and matured I witnessed many major advancements. In 1967 the Toronto Maple Leafs won their last Stanley Cup. During my fifth year on the planet man landed on the moon. As time went on the microprocessor, the cell phone, and the computer was invented. The war in Vietnam ended, and the economic fundamentals improved. And on this day in history, July 31, 1981 (I know today is August 1, but that was also a weekend back in 1981) the Dow Jones industrial average closed at 952. And by September 4, 1981 the Dow had fallen to 861. In other words, during the first 17 years of my life, the Dow Jones Industrial Average actually fell. By March 12, 1982 it was down to 797. So why, during this wonderful period of technological innovation did the market remain stagnant, and even fall? Here’s a guess: high interest rates. I bought my first house in 1989, and the interest rate on my mortgage was 13.5%. I renewed my mortgage yesterday on a two year term for 3.4%. (I had planned to pay it off, but if money is free, why bother?). Interest rates are low, my friends. Could it be that high interest rates in the 1970s and 1980s depressed the stock market? Could it be that very low borrowing rates, for solid companies, has increased stock prices this year? As an investor, you can put your $1 million nest egg into a term deposit at a bank and earn less than 1%, or you can put it in the stock market. Since you earn nothing in a bank account, there’s not much of a downside to a stock market investment, is there? So investors put money in the market, and the market goes up. So more people put money in the market, and so it goes. The smart money has used the last three months to dispose of the stock they no longer want, and I fear that the time has come for them to step aside and let the true extent of the bad economy shine through. I don’t like the looks of August. I’m going on vacation again this month, and we all know what happened when I went on vacation in August, 2007. (That was actually one of my better commentaries, actually; you may want to read it again). Interest rates must start increasing. The treasury auction this week was a disappointment, as interest rates were increased to allow the government to fund it’s massive deficits. The U.S. economy continues to shrink. The next wave of credit delinquencies and defaults is just beginning. Unemployment remains high. Government spending is at record levels. Swine flu could be a serious drag on the economy this fall. Oh, and did I mention the whole Simpson/Romo break up? Things are bad, and getting worse. I will continue yelling at the wind; my efforts may be futile, and I may continue to look wrong, but I am not prepared to throw money at this market. We’ve had corrections in August before, and we may again this year, so I will sit on the sidelines for a while yet. Thanks for reading, and for those of you living in provinces in Canada that get Monday off (which is all of them, I think), enjoy the long weekend, and talk to you next week.